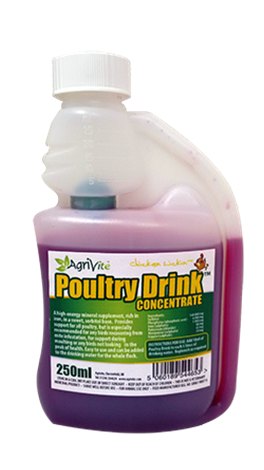 Poultry Drink - A high energy mineral supplement rich in iron in a sweet tasting sorbitol base. A high energy mineral supplement that is rich in iron in a sweet tasting sorbitol base. Instructions for use: Add 10mls of Poultry Drink to each 5 litres of drinking water. Replenish as required.